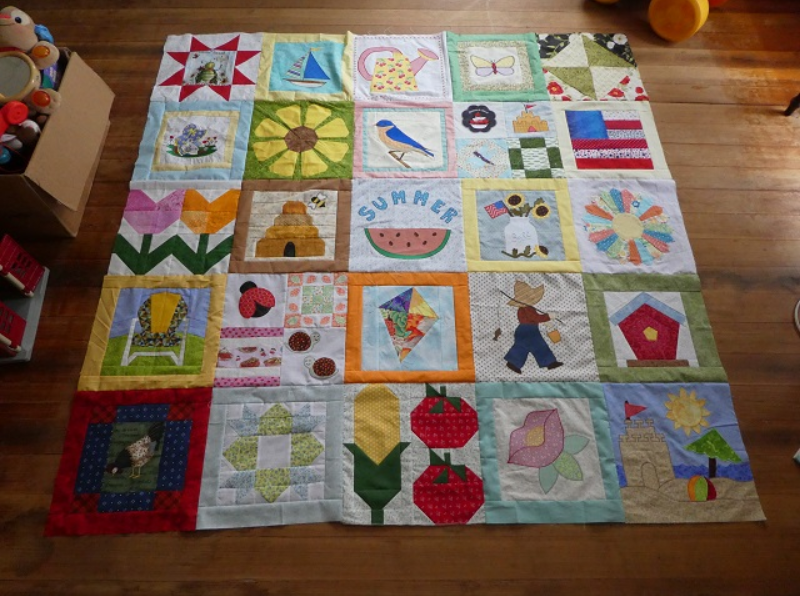 Quilt layout for non-matching summer blocks? 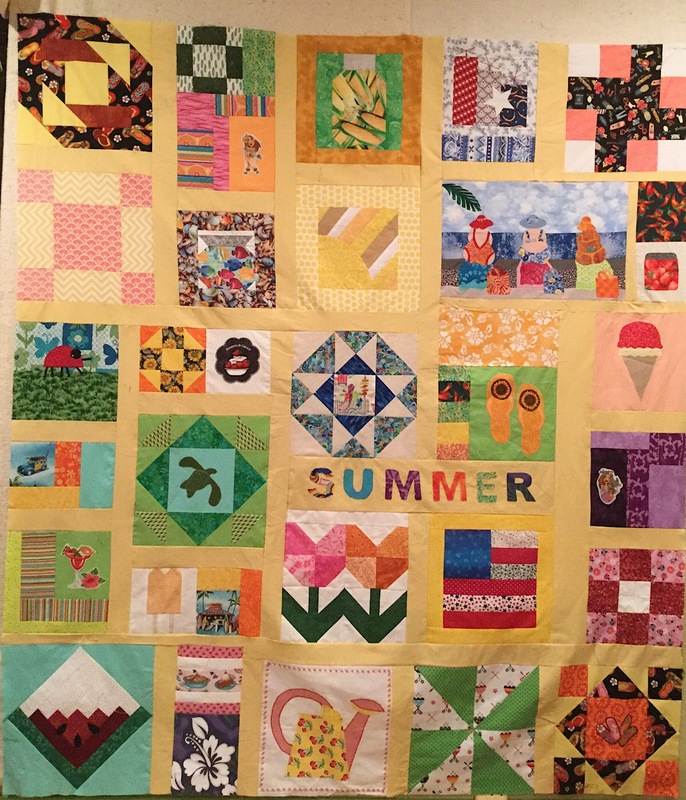 Thread: Quilt layout for non-matching summer blocks? What should I do with the blocks I got in the summer block swap? There are 6”,9” and 12” blocks. The theme is summer. The colors are random. One 9” watermelon block is on point. The blocks are beautifully made. 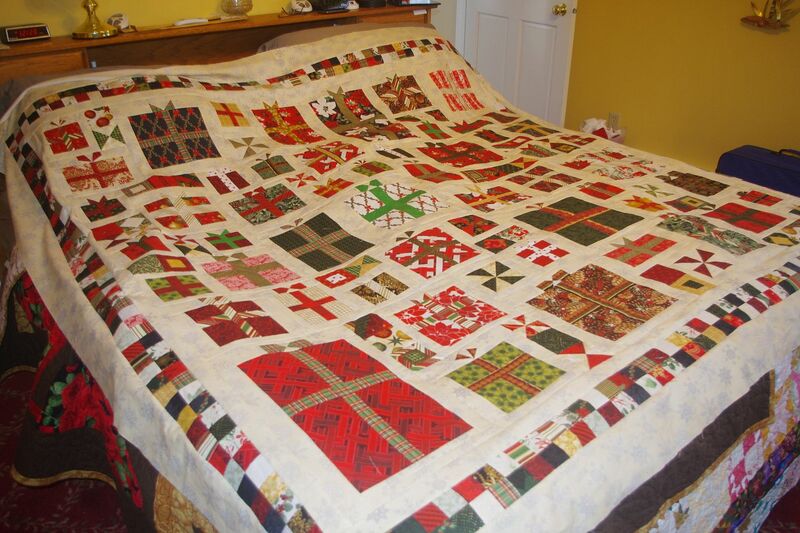 Have you done any quilts with blocks like this? Can you show them to me? What I do is figure out the largest block and then build all the others blocks to that size. Either by adding borders or combining the smaller blocks. Hope this makes sense and helps. I would just start by playing with them on your design wall. First I would stack up all the same sizes. I'd probably consider what block(s) I wanted as the focal/centre block, and put it on the wall. Then start building around it with the others. You may find you have some spaces, and want to make a few more blocks to fill those in. ​Always are challenge and most make a simple block like a half square triangles to get the smaller blocks up to size. You have quite a few different colours but if you could find a rainbow fabric for the fill ins, that might look nice. Maybe this layout I did with EQ7 will help you. I hope you can see the red lines, they are 4" apart so should give you an idea of the different widths of sashing you would need. This is one I did last year. It was a challenge, as I had to make the blocks first with already cut squares. Well I’ve been playing around with it. All the suggestions were good and I used them. I love Gays suggestion and will try that on my design wall, although I’m not sure I want to frame all the blocks. I’d like to finish this up quickly. I know it will really look busy without doing that. Here is one option. The watermelon block is oversized. so I’ll have to figure that out. I still need to cut a few fillers. I plan to have the word summer on the blue rectangle. It’s 4’9” square. I’ll sit and look at it a few days and see if I can convince myself to do the framing. Thanks for the suggestions, they were helpful. You're well on your way to a lovely quilt! I'll be watching to see what you do...I still have mine that I haven't put together! I really like Gay's layout! When I did mine I added white borders to calm it and kept the watermelon on it's side. I didn't enter as many blocks as you did so I didn't have as many beautiful blocks to arrange! I'm finishing up a tee shirt quilt with different sizes, so I understand how complicated that can get! "Here is one option. The watermelon block is oversized. so I’ll have to figure that out." How about you put the watermelon block on the back (as a label?). You could put it on point there (if you like). And add label info (made by; assembled by; date; etc.) using fabric marker or embroidery in the white "logs" of the block. 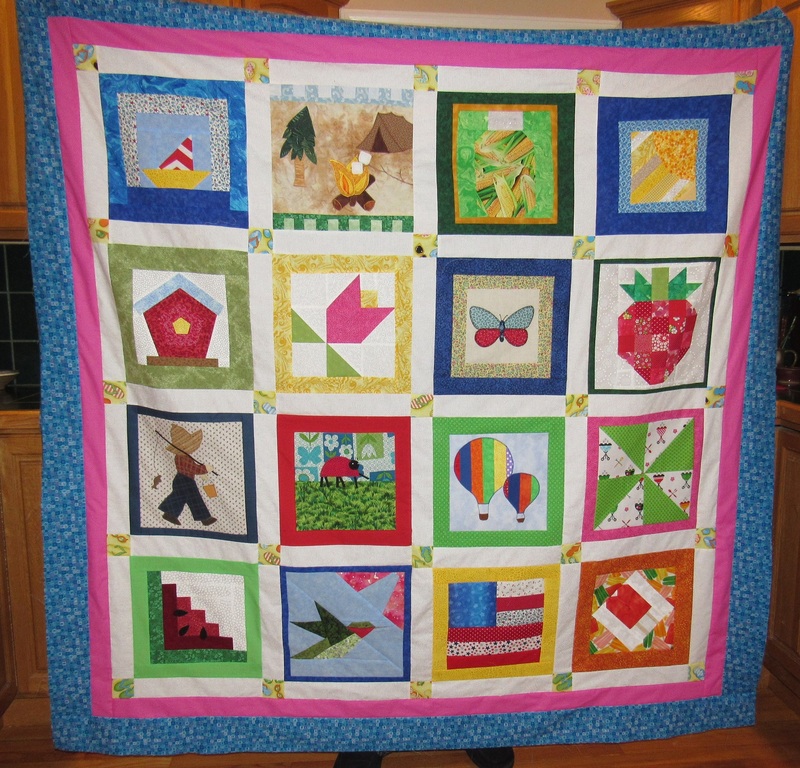 It will be a nice quilt, and bring you memories and smiles every time you look at it. Have fun with it. I think you have a great start of your layout and probably you are going to have to have some filler fabrics in between. I feel white fabric would be nice to separate each block or 2 blocks together. I really like the idea "danydany" suggested with the watermelon block as a label on the back. This way you could make notes on the white fabric giving info of why the quilt was made. Good luck on your decision and please share with us your finished layout. I was in the same swap. Here's how I did mine. I made a few extra, too. I have since added borders, red with white polka dots fabric. I still need to quilt it. here is one I did with assorted sizes of blocks - they are all 3 base (after sashing - I used that to get them to the correct size), with some pinwheels and square in a square to fill in some spots. Last edited by Macybaby; 02-12-2019 at 08:37 AM. This is a Jen Kingwell design. It might be hard to tell, but I used the same basic layout of this quilt to figure out what sizes to use for the "present" quilt posted above. Found it! Here is a picture of my top from that swap. 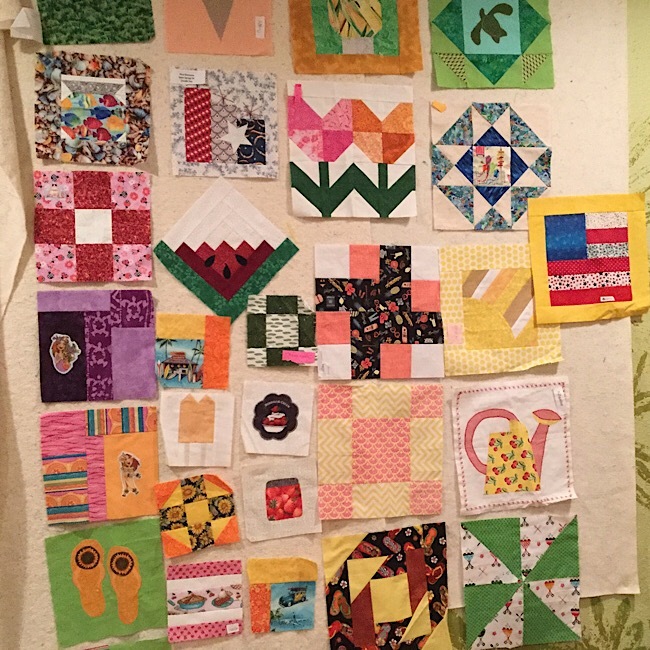 You do have more blocks -- you could always use the smaller blocks to make a baby quilt or two lap size quilts! 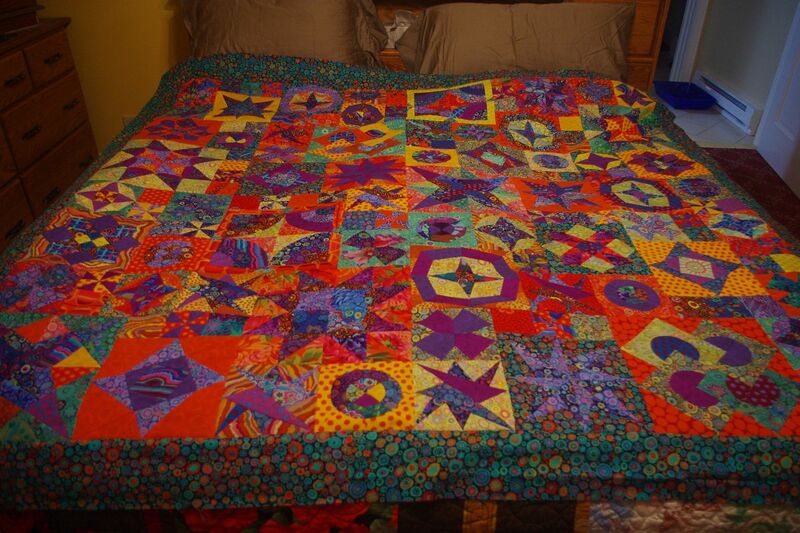 I love quilts with different size blocks. Can't wait to see yours all done. Irishmom has a good suggestion and great layout. 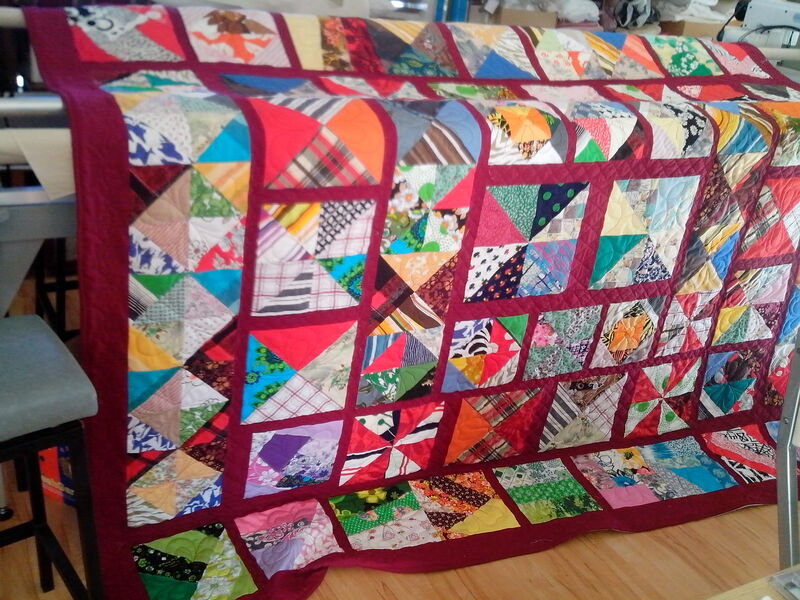 NZquilter's layout is great too. Good luck I am sure yours will be beautiful too. What I would do is choose one color as a blending neutral and turn all of the blocks into 12 in squares and put them together. The blocks will "float" and each will shine in its own glory. What color? Humm, It may be way out there but orange or coral or black. Audition colors from your stash and see what you like. Have fun with this challenge! The assorted borders and sashing look good with your directional blocks. I have some assorted orphan blocks that are getting wonky borders, where oversized borders go on and same-sized blocks are cut at an angle. Thank you for all the suggestions. They sparked me to float the blocks and they look much better that way. Gave me lots of inspiration and ideas. I would’ve liked to use a soft orange sashing but what I had in my stash was the soft yellow. It was really helpful to have a big design wall. My design wall is just some batting pinned to the wall with push pins. I put the blocks up and figured out what size sashing was needed as I went. I didn’t try to figure it out beforehand and was ok with sashing being different sizes. This made for an interesting process. At the end I was adding sashing to the top middle of the quilt. I added several little blocks. I was going to do them in solid colors to calm it down. Then I decided that was a lost cause, so for many of them I used pattern fabrics that were special to me. I made the beach bums block to fill out the blank spot I came up with. You might have seen this pattern before, it has 5 beach buddies. I reduced the pattern by 50 % and only used three beach ladies. Quilt top isn’t ironed. I’m never good taking square pictures and reducing the size but here it is. 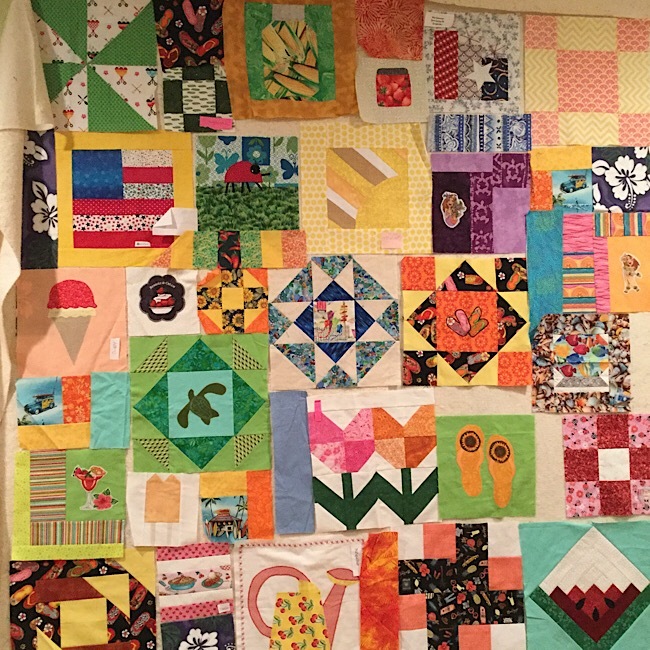 Here are some of the Quilter’s who made blocks Armylady,suzisew, judith1005, graceful Ann, Kimberly Texastam, nzquilters, redgarnet. Ljdugas. These were some of the folks from the summer swap. If I missed yours please let me know, those little name tags tend to escape. There were two blocks from one of the booms too. I if I get motivated I’ll enter it in the county fair this summer under group quilt. these are such great blocks! Wow, that looks beautiful, mjpEncinitas!! !